In an attempt to put some lighter and remotely healthy dishes on the menu list, I hit upon the half-way house that is "something with salad and a jacket potato" idea. The something being the star of the show, the salad being the healthy bit and the jacket potato takes on the role of the filler. You see, I've discovered that if you go from big old hearty stews with dumplings, enormous bowls of steaming pasta, lovely warming soups etc. straight to salads, what you wind up with are a lot of peckish chaps by 9pm. So, in this intervening period (Spring, some call it) I've been trying to hit upon nice half-way house types of recipes that suit the weather and suit everyone's need for something fresher and lighter for dinner. Of course, needless to say, by next week it'll be sub-zero overnight and we'll be hankering for the old Shin of beef stews again - but I might as well try! 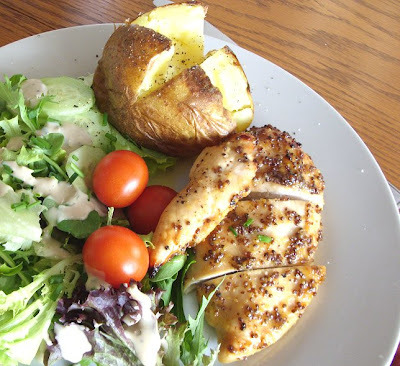 This Honey Mustard Chicken recipe is a perfect example of a recipe of the type. The chicken is served hot, as is the jacket potato - so both warm you up a bit on a chilly evening. However, the salad provides that fresh flavour and crunch that your tastebuds have been hankering for, after a couple of months of root vegetables. In fact, this chicken recipe is the first for aeons that the glaze has actually gone right - and glazed the chicken, instead of falling off and resisting all attempts to have it do any glazing. Instead, it normally winds up laying in the bottom of the pan sulking, claiming it's "not in their job description" and "a real cook would know how". This glaze - whether it was the hotter temperature, or the size of the pan I got right - worked perfectly and the chicken came out of the oven suitably glazed, with a lovely soft, perfectly cooked middle. Because I was cooking the Jacket Potatoes at the same time, I had the oven temperature up at 200 deg C instead of 180/190 deg C - which is what I would normally cook chicken at. It seems as though I shall have to try this hotter temperature again, as it seemed to do the trick beautifully. A word about the Jacket Potatoes themselves. They were Asda's Extra Special Marabel potatoes, which I would heartily recommend. They are sweet and fluffy - and the skins taste really richly potato-like. Oh, and ignore the "won't need butter" instruction on the label - they might not NEED butter, but every jacket potato should have SOME butter! 1. Pre-heat oven to 200deg C (fan). 2. Take the three baking potatoes and clean them thoroughly, removing any dodgy looking eyes or scratch marks. 3. Rub in the olive oil to the skins of the potatoes and place onto a baking sheet. 4. Season both sides of the potatoes, then place into the oven for an hour. 5. Mix the honey and mustard together in a small bowl. 6. Arrange the chicken breasts in a baking dish and spoon the honey/mustard mix over, taking care to cover every inch of the chicken. 7. Place into the oven for 25-30 minutes or until the chicken is white all the way through when pierced with a knife. 8. In the meantime, open a bag of herb salad and arrange a portion onto each of the three plates. Add the cherry tomatoes and cucumber. 9. When done, place each jacket potato alongside the salad. Cut a cross into the top of each and squeeze gently to raise the flesh of the potato. Add a knob of butter, a tbsp of soured cream and sprinkle the chives over. 10. Add the chicken, cut into three portions, beside - and serve.